A wave of disbelief and disgust traveled quickly across social media in response to a presentation given at the ACOG 2018 Annual Clinical and Scientific Meeting suggesting that using condoms to prevent pregnancy was ACOGs best advice for reducing the maternal mortality rate that is on the rise in the USA. As the only industrialized country to hold the dubious honor of having the most expensive system of maternity care while its outcomes are worsening, the profession who presides over the vast majority of those births seems to think that a cartoon condom holds the answers. Given that these statistics are three times worse for women of color, the sentiment takes on a racist tone to add to the misogynist attitude that is at the heart of the power dynamic identified as a leading contributor to obstetric violence. This is a dynamic that puts birthing people in a vulnerable position with an "expert" who expects compliance and does not allow for personal autonomy in decision making. Unnecessary interventions or undue influence, coercion and even threats are hallmarks of obstetrical violence whether perpetrated, knowingly or unknowingly, by institutions or practitioners. Read more about obstetric violence here. To add insult to injury, ACOG apologized, not because they recognized that the magnitude of their statement was inherently violent, but simply because people had become upset. This apology was one that had the air of only being sorry because they got caught – an afterthought that felt disingenuous. Like so many of the words we hear from those who profit from manipulating us into doing what benefits them more than it does us, the apology didn’t go far enough to show sincerity. So, what to do? If the words seem meaningless, then how will we know what is real? What tape measure can we use to know what to believe? 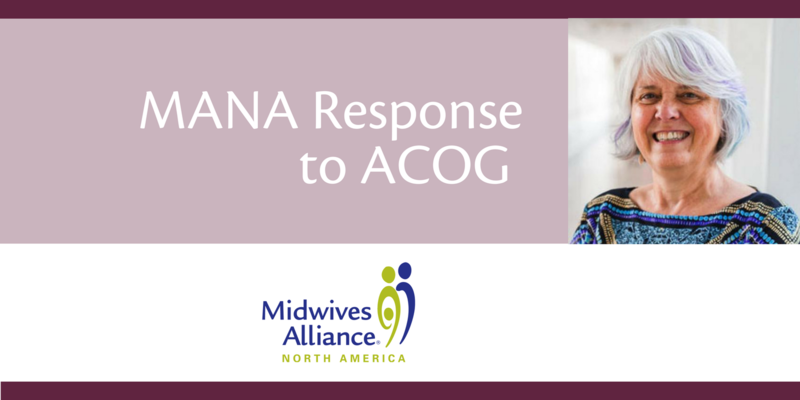 What actions would we need to see before we can believe the words that we hear when ACOG tells us they care about maternal mortality and about the families they serve? Each professional organization and credential has a responsibility to put the families we serve in the forefront of every decision we make. We expect that of MANA, and we expect no less from ACOG.